He questions the belief that on the Eurasian steppes men were riding in battle as early as 4000 BC, and suggests that it was not until around 900 BC that men anywhere - whether in the Near East and the Aegean or on the steppes of Asia - were proficient enough to handle a bow, sword or spear while on horseback. 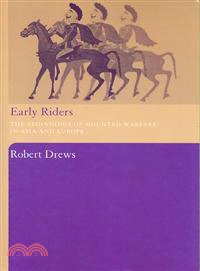 After establishing when, where, and most importantly why good riding began, Drews goes on to show how riding raiders terrorized the civilized world in the seventh century BC, and how central cavalry was to the success of the Median and Persian empires. Robert Drews is Professor of Classics and History at Vanderbilt University, where he has taught since 1961. One of his interests is the military history of the Near Eastern and Greek world during the Bronze Age, and his publications on that subject include Coming of the Greeks and The End of the Bronze Age.